For the longest time the den has been waiting to acquire an identity. It's an awkward room, long and narrow, spanning the width of the house. Windows all along one side, another on one end, and the rest just blank space. A tunnel. Down the road we hope to put a fireplace and built-in shelves at the end, but that is likely years away, and in the meantime the blank walls have been echoing. Annoying, because we do a lot of playing, homework, resting, napping, eating, and living in here. Last week while antiquing with my mother, I ran across a step-back cupboard. It had been in the home of a Versailles dealer for awhile, and is in lovely condition. It feels very Kentucky-ish, very streamlined, of cherry and walnut. Age? Anywhere from the 1820s to the 1860s, most likely. 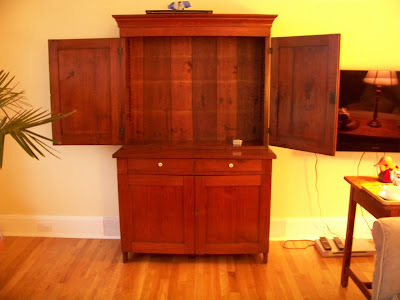 It's nicely constructed with square nails, handsome dovetailing, and with properly hand-adzed chamfering on the drawers, plus hand-cut wood notches so that the upper-cupboard's shelves can be moved as needed. The boards are splendidly wide in key places, the upper door panels' joins have widened into gaps with the aging of the wood, and oh, it's nice and heavy. Good thing that like much case furniture of the day, it's in two pieces. Good thing, too, because Mom and I moved it from the pickup into the house by ourselves. That surprised Curte later: how'd we get something heavy off the pickup, up the steps, and in by ourselves? When two women really want to do something, you'd be surprised at what's possible, I wanted to say, but grinned instead. With the cupboard in place, and Mom's sweet loan of a little country table from New York, where I grew up, the room started to build into place. Lamps and tables moved, the few pictures and a mirror too, and when the lamps were lit, the space started to show how cozy it could be. Now for sconces to either side of the cupboard, the TV moved to inside it, some photos and paintings, a down pillow or two, working London shades at the windows, trim at the top of the walls, an hollow ottoman that can hold the boys' toys... Well, all of that will take lots of time but the point is, it's an echoing tunnel no longer. It's beginning to be home. The cupboard is fantastic! It does look cozy! I need to learn to decorate, I can work out outfits but not home decor. Or maybe it's just I don't have the money for the decor I want. Laura, take heart. It's all a learning process, like sewing, and I am a huge believer in saving up and resisting random purchases. Jenni, in the summer, true, it's an outside-in room. It's wintertime that brings the gray through the windows, and that's what brought on this frenzy. I couldn't take the blue-gray creeping inside anymore, so fought back with yellow, green and red. Thanks so kindly! I've been awarded this award in the past, but it's so nice to be awarded it yet again!